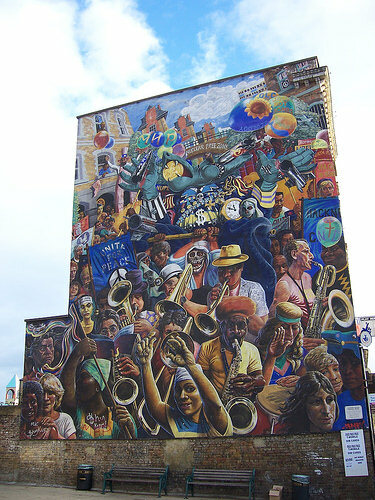 The beautiful musical mural on Dalston Lane. Description: This mural was designed by Ray Walker and finished by artist Mick Jones after Ray fell ill (he died suddenly aged just 38). Mick is seen playing the saxophone and Ray's wife is at the bottom right. 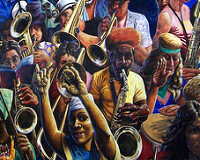 Ray's face can be seen surrounded by ribbons on the bottom left of the mural. Jones and Walker's widow, Anna, spent a year painting the mural, using techniques and materials of such high quality that, despite 17 years of weather, it is in excellent condition and looks astonishingly vivid. The mural echoes the Mexican muralists but also trade union murals.